“Being persuaded that a just application of principles, on which the Masonic fraternity is founded, must be promotive of private virtue and public prosperity, I shall always be happy to advance the interests of the Society, and to be considered by them as a deserving brother,” President Washington told Rhode Island’s King David’s Lodge in 1790. Stone masons, during the Middle-Ages and after, were among the most ethically correct of the local tradesmen. Freemasonry is the world’s oldest fraternal order, a brotherhood that combines talent, intellect and virtue. By 1733 the colonies had established at least three Masonic lodges: in Boston, Savannah, and Philadelphia. The order’s ceremonies, as novelist Dan Brown has noted, are shrouded in secrecy. Freemasonry is not a religion; it is a non-denominational order that borrows from religion. It is coincident with the Age of Enlightenment, a fraternity that emphasizes “personal study; the dignity of man and the liberty of the individual.” Freemasons worship as they choose. “It has been suggested that [George Washington] learned as a Mason to believe in a ruling Providence rather than an orthodox Christian deity,” biographer John R. Alden wrote. Alexandria-Washington Lodge No. 22 meets regularly in George Washington Masonic National Memorial. A National Historic Landmark, the Memorial is located at King and Callahan Streets, atop a high hill. Charles Callahan chose the Alexandria site in 1908; then donated four of the necessary eight lots. The century old Memorial interprets both fraternal and George Washington history. 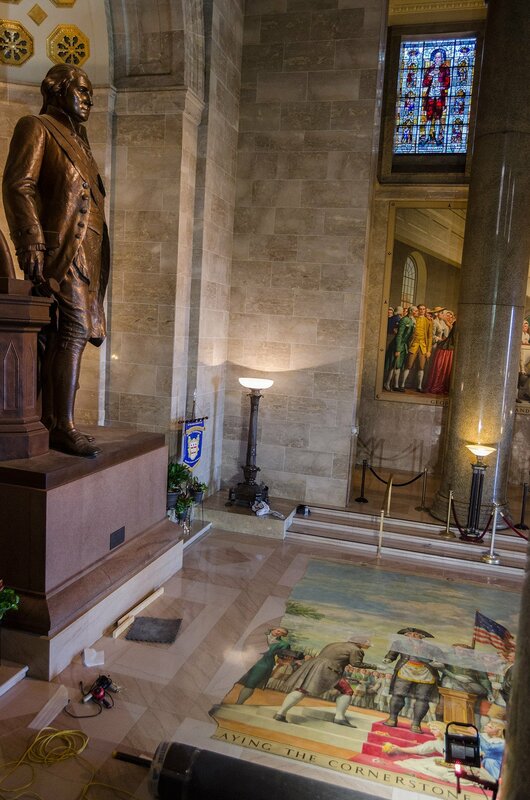 The Memorial Hall’s George Washington statue stands 17 feet, 3 inches tall and occupies a central space. The bronze statue, delivered in eight pieces, was designed by Bryant Baker as a character statement. Washington stands alone, a symbol unto himself, the wise Master of the lodge. The statue was dedicated in 1950 by President Harry S. Truman, a Mason who credits the fraternal order with his 1948 Presidential win. “…the Cause of Virtue and Liberty is Confined to no Continent or Climate, it comprehends within its capacious Limits, the Wise and good….,” George Washington wrote in 1775. Truman’s speech was timely, then and now. “We are convinced of the necessity for an international agreement to limit the use of atomic energy to peaceful purposes,” Truman persisted. For 1950 was post Hiroshima; the year of Senator Joe McCarthy, the Algier Hiss trials, and the onset of the Korean War. North Korea’s Communist troops crossed the 38th parallel and invaded South Korea on June 25, 1950. When Democrat Harry Truman announced his decision not to run for another Presidential term only 25% of Americans thought he was doing a good job. Truman, who became a Mason in 1909, now is regarded as among the nation’s greatest Presidents. Like most Americans Freemasons believe Truman bettered mankind. “Probably the most momentous occasion in the annals of Masonry in the United States will pass into history,” The Washington Post reported in 1923, “when the cornerstone of the great granite building being erected as a memorial to George Washington is lowered into place.” The building has five orders of architecture, three of which are included in the Masons’ teachings. The 1931 cost: $4 million. Dedicated in 1932, the 85 year-old building is undergoing repair. Interior walls are “bulging” inexplicably and valuable artifacts, including the murals, have been jeopardized. 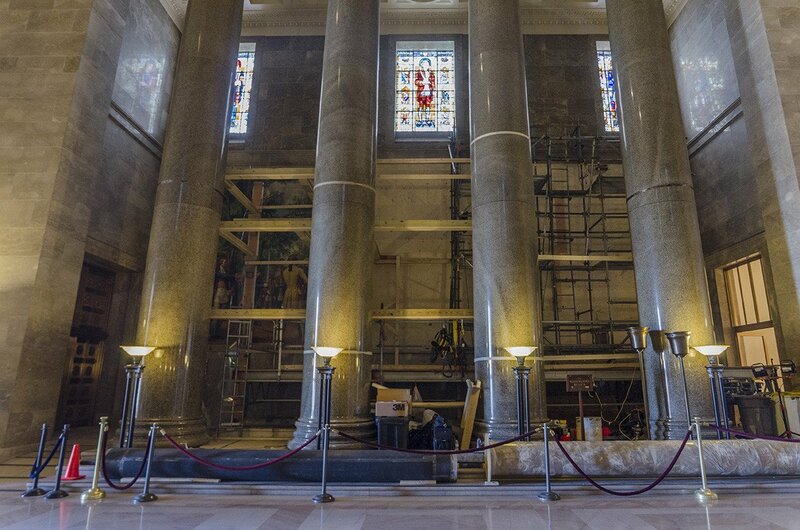 The mural depicting the 1793 U.S. Capitol Cornerstone Laying Ceremony, an 18’ x 46’ canvas completed in 1955 by American artist Allyn Cox, was removed last March for restoration. “The South East corner Stone, of the Capitol of the United States of America in the City of Washington, was laid on the 18th day of September 1793, in the thirteenth year of American Independence, in the first year of the second term of the Presidency of George Washington, whose virtues in the civil administration of his country have been as conspicuous and beneficial, as his Military valor and prudence have been useful….,” The Columbia Mirror & Alexandria Gazette reported. The apron and sash worn by President Washington during these ceremonies can also be seen in the sanctum of Alexandria-Washington Lodge No. 22. The second floor Replica Lodge Room includes the Memorial’s George Washington collection. Now the George Washington Masonic National Memorial needs your support. For more information, including tours, building requests and the Century Landmark Campaign, visit www.gwmemorial.org. Sarah Becker started writing for The Economist while a graduate student in England. Similar publications followed. She joined the Crier in 1996 while serving on the Alexandria Convention and Visitors Association Board. Her interest in antiquities began as a World Bank hire, with Indonesia’s need to generate hard currency. Balinese history, i.e. tourism provided the means. The New York Times describes Becker’s book, Off Your Duffs & Up the Assets, as “a blueprint for thousands of nonprofit managers.” A former museum director, SLAM’s saving grace Sarah received Alexandria’s Salute to Women Award in 2007. Email: abitofhistory53@gmail.com.